A little old school dancing… – Nerdwatch! Strolling through the Youtube archives is one of my favorite pastimes, since you never know what you’ll come across. 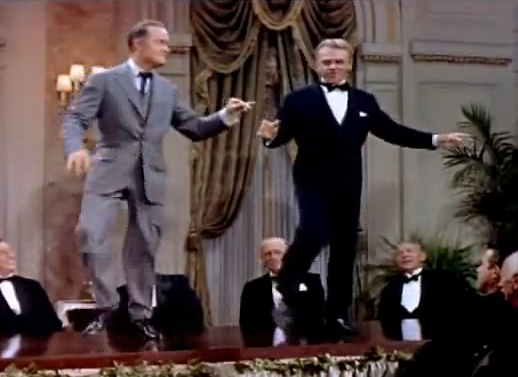 I knew James Cagney could dance, even though he also played gangsters and other tough guys in the old movies, but I never knew that Bob Hope could hold his own in tap-dancing. If I had ever seen the movie “The Seven Little Foys” I would have learned better. This is a great scene with Hope playing Eddie Foy and Cagney playing George M. Cohan, doing a tap-dance “face-off”, and it is a joy to behold. Today’s pop-and-lock dancers do similar competitions with each other, but these guys were hitting it 60 years ago! If you watch closely there’s a part where Hope almost does a “moonwalk” while tap-dancing. Tagged Bob Hope, James Cagney, old school, tap, tap-dance. Bookmark the permalink.